UPDATED: Sat., May 27, 2017, 9:59 p.m.
BEL AIR, Md. – As Cpl. Kevin Phillips pulled up to investigate a suspected opioid overdose, paramedics were already at the Maryland home giving a man a life-saving dose of the overdose reversal drug Narcan. Drugs were easy to find: a package of heroin on the railing leading to a basement; another batch on a shelf above a nightstand. The deputy already had put on gloves and grabbed evidence baggies, his usual routine for canvassing a house. He swept the first package from the railing into a bag and sealed it; then a torn Crayola crayon box went from the nightstand into a bag of its own. Inside that basement nightstand: even more bags, but nothing that looked like drugs. Then – moments after the man being treated by paramedics came to – the overdose hit. Carfentanil came to mind because just hours earlier, Phillips’ boss, Harford County Sheriff Jeffrey Gahler, sent an email to deputies saying the synthetic opioid – so powerful that it’s used to tranquilize elephants – had, for the first time ever, showed up in a toxicology report from a fatal overdose in the county. 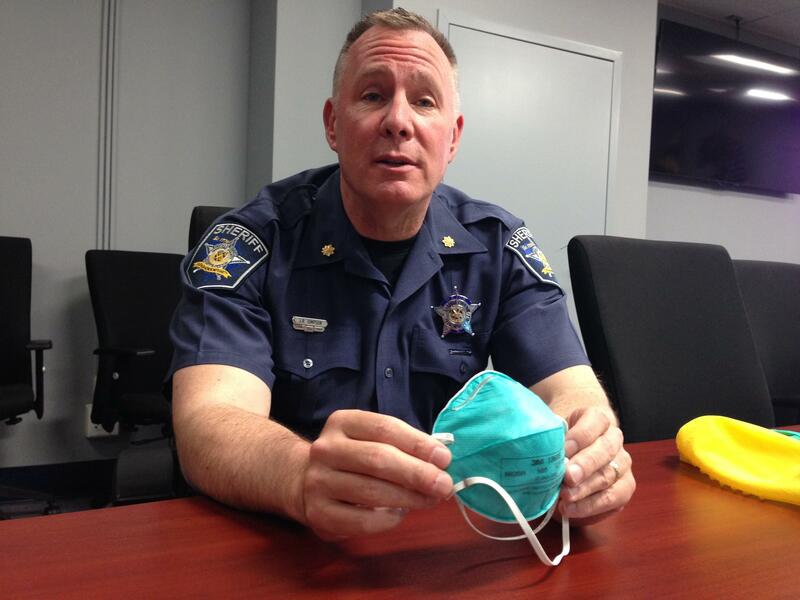 The sheriff had urged everyone to use extra caution when responding to drug scenes. Carfentanil and fentanyl are driving forces in the most deadly drug epidemic the United States has ever seen. Because of their potency, it’s not just addicts who are increasingly at risk – it’s those tasked with saving lives and investigating the illegal trade. Police departments across the U.S. are arming officers with the opioid antidote Narcan. Now, some first responders have had to use it on colleagues, or themselves. The paramedic who administered Phillips’ Narcan on May 19 started feeling sick herself soon after; she didn’t need Narcan but was treated for exposure to the drugs. Earlier this month, an Ohio officer overdosed in a police station after brushing off with a bare hand a trace of white powder left from a drug scene. Like Phillips, he was revived after several doses of Narcan. Last fall, 11 SWAT officers in Hartford, Connecticut, were sickened after a flash-bang grenade sent particles of heroin and fentanyl airborne. Phillips’ overdose was eye-opening for his department, Gahler said. Before then, deputies didn’t have a protocol for overdose scenes; many showed up without any protective gear. Gahler has since spent $5,000 for 100 kits that include a protective suit, booties, gloves, and face masks. Carfentanil can be absorbed through the skin and easily inhaled, and a single particle is so powerful that simply touching it can cause an overdose, Gahler said. Additional gear will be distributed to investigators tasked with cataloging overdose scenes: heavy-duty gloves and more robust suits. Gahler said 37 people have died so far this year from overdoses in his county, which is between Baltimore and Philadelphia. The county has received toxicology reports on 19 of those cases, and each showed signs of synthetic opioids. Other changes for Harford deputies include carrying bigger doses of Narcan – four milligrams instead of single-milligram doses. Because synthetic opioids are so potent, more of the antidote is necessary to reverse an overdose. Deputies have also been instructed not to try to field-test drugs from overdose scenes; instead, they send it to a lab. Todd Edwards, a spokesman for the Drug Enforcement Administration in Baltimore, said drug users and officers are encountering fentanyl and carfentanil because the substances can be easily ordered over the internet, and dealers only need to mix a tiny amount into a batch of heroin in order to significantly stretch their supply. Edwards said the DEA is trying to spread the word about fentanyl, carfentanil and something called “gray death,” which is a mixture of both, plus heroin and other substances. Edwards said agents are working with medical examiners’ offices, police and community organizations to increase awareness. But because of the scope of the problem, it’s a struggle. Despite the warnings, Phillips was shocked by the power of the poison he was exposed to. “Even though I did the same thing on this call that I’d done on 100 other calls, and all those other times I was fine, this time I wasn’t,” he said. Published: May 27, 2017, 1:40 p.m. Updated: May 27, 2017, 9:59 p.m.